Do you work with intention or are you running around constantly putting out fires? Anthony Ongaro shares how to live and work more intentionally and less reactively. He is a talented freelancer filmmaker and videographer. 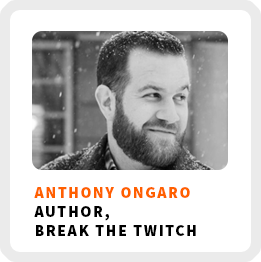 He also recently published his first book, Break the Twitch, a Practical Guide to Minimalism and Intentional Living. Shares his process for identifying his values. How he broke a 20-year bad habit and he shares a step-by-step process for how you can break your own twitches. How working for himself enables him to integrate all of his different skills and interests as a multipotentialite. Core work activities + habits: 1) Writing, six days a week. 2) Getting enough sleep. 3) His “batting cages,” or his basic, core habits like tidiness, laundry, eating well, etc. Ideal work environment: In a coffee shop, drinking a large latte, with his laptop, and big over-ear headphones with either low-key background music or silence. Book recommendation: The Power of Habit by Charles Duhigg and Hooked by Nir Eyal. 90-day goal: Launch the book, take time completely off for a while, and then focus on creating more videos and blog posts. 2) Do it throughout a full day to examine everything you’re doing and you may start noticing patterns and tendencies. 3) Understand that it’s a process.